This man calls himself a journalist. He works for one of the most respected and influential news outlets in America. Rogin’s post is obnoxious and idiotic for a whole host of reasons, among them the fact that Trump is consistently painted as a Kremlin stooge by pundits like Rogin, yet opposing Trump is somehow being depicted as Kremlin servitude. But the reason his tweet deserves an article of its own today is because the argument he is using is one you see recurring over and over again in the psychotic, pants-on-head, screaming-at-traffic stupid salad that is collectively referred to as Russiagate. You see this obnoxious McCarthyite talking point regurgitated over and over and over again by people eager to paint anyone who objects to US interventionism and the political establishment responsible for it as Russian agents, and it’s about as moronic an argument as any you’ll ever see. Last year I had a brief interaction with a popular Twitter account calling itself Conspirador Norteño, an anonymous user who spends their time promulgating conspiracy theories about Russian bots and Kremlin trolls using those weird “who’s tweeting about subject X” graphs that Russiagaters like to use as imaginary evidence. The account is often cited by the Atlantic Council’s NATO propaganda firm DFR Lab, and by its allied narrative control firms Bellingcat and PropOrNot, as well as mainstream media outlets like the BBCand Mother Jones. If a Twitter account a) consistently parrots the views of the Kremlin over a period of several years and b) uses Russian state media as major primary sources, as @Ian56789 does, then it is reasonable to classify that account as propaganda. Opinion doesn't enter into it. Conspirador Norteño and his goon squad of counterintelligence-LARPing followers spent the entirety of our interaction attempting to argue that because a private British citizen named Ian Shilling sometimes shared Russian state media and often found himself in agreement with Russia on foreign policy, he could fairly be labeled a propagandist for the Russian Federation. “If a Twitter account a) consistently parrots the views of the Kremlin over a period of several years and b) uses Russian state media as major primary sources, as @Ian56789 does, then it is reasonable to classify that account as propaganda,” the account insisted. “You’re also ignoring the fact that his positions are in lockstep with the Kremlin’s; pushing the viewpoint and agenda of a government is propaganda, regardless of which government it is,” the account claimed. The reason this popular McCarthyite argument is so face-meltingly stupid is simple: there are many, many reasons for someone to oppose the interventionism and foreign aggression of the US and its allies besides having loyalty to the Russian Federation. Russia opposes the interventionism of the US-centralized empire because it is a nation with its own allies and agendas, and because it is a longtime target for subversion and undermining by imperial government agencies since it refuses to be absorbed into the blob of the western power alliance. This does not mean that Russia’s reasons for opposing western interventionism are the only reasons to oppose western interventionism, and anyone who believes that it is is a slobbering idiot. 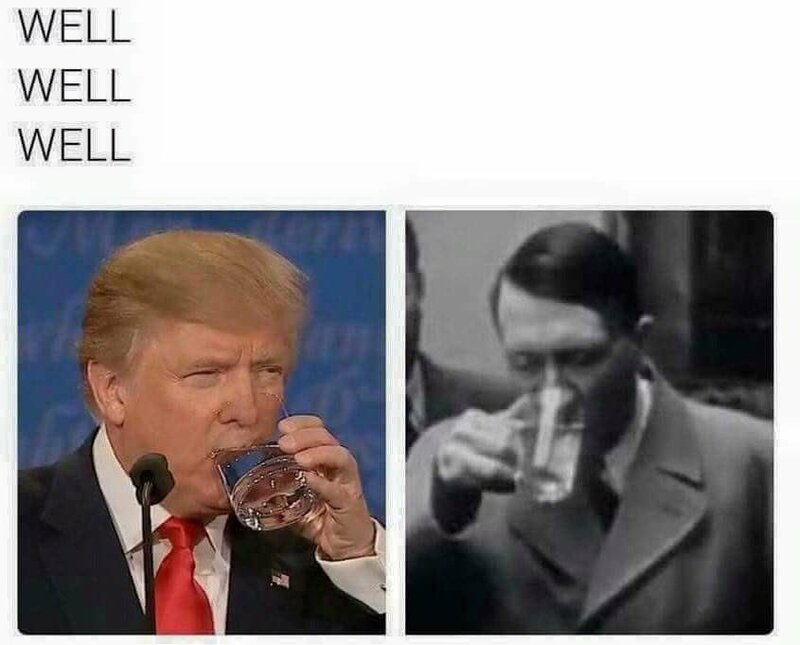 This is a non-satirical version of the “Hitler drank water” meme, which mocks this style of argumentation by pointing out the fact that both Adolf Hitler and Donald Trump drank water, implying they must therefore be aligned. The argument that is advanced by all the Josh Rogins and Conspirador Norteños of the gibbering McCarthyite mad house holds that the only possible reason anyone could possibly oppose an establishment which is in an endless state of regime change interventionism, which is pushing us ever closer to the likelihood of nuclear armageddon by escalating tensions between nuclear superpowers, and which is shoving us toward extinction via climate chaos with a policy of unchecked ecocidal corporatism, is some form of Kremlin servitude. They claim there’s no acceptable reason anyone could be “in lockstep with the Kremlin” on foreign policy, despite the fact that a worldview which opposes western interventionism necessarily will be the same as the position of the Kremlin’s because Russia, like so many other sovereign nations, opposes western interventionism.